With all of the disasters that have happened lately, many families have been without electricity, and experiencing the joys of cooking and serving meals to their families in spite of the challenges. Others have electricity but not a full kitchen to work in. Their homes may be safe enough to live in, but without electricity, they can’t use some of the appliances in the kitchen. 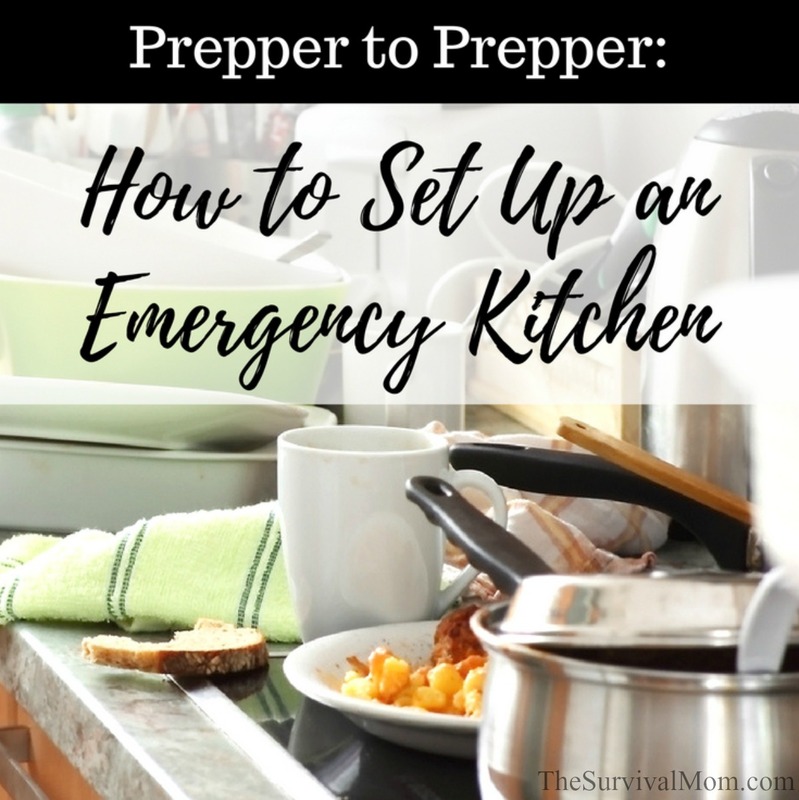 I asked my Facebook readers to share their experiences and advice about setting up an emergency kitchen. As usual, never fail to impress. By the way, you are invited to join my Facebook page and participate in discussions just like this one. Click here to Like and join! I just moved into a new home that was being remodeled so we didn’t have any appliances. I used my instant pot several times a week and the outdoor grill the rest of the time. TIP: The Instant Pot is a lifesaver, and not just for emergency kitchens. Read more about it here. I live in Florida and this scenario happens about once a year where we live. We lose power for about a week. 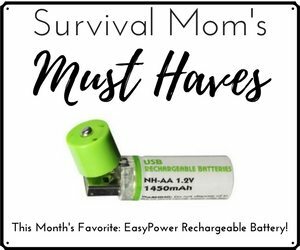 So, we have it kind of down to a science on how to survive without power during this time. We tend to eat things that don’t need refrigeration or we use a propane camping stove or cook over an open fire. We can cook fried spam and eggs for breakfast, or the kids can eat pop tarts. For lunch it’s mostly peanut butter and honey sandwiches, and for dinner, I try to go all out and cook on the stove with a meat, instant rice, or another quick starch to cook, along with canned veggies. Or we can do hotdogs and chips one night. You just have to adjust. It’s not fun and we are always happy when the power comes back. I was homeless for a year. I used a Coleman 2-burner stove. I wanted a rocket stove but couldn’t afford one, and had no secure place to have it delivered. Now I have 2 camp stoves, a folding Sterno, and a rocket stove is on my wish list. After a flood subsides there’s a LOT of dead wood around. Same for high winds; at the least, it knocks the deadwood to the ground, which then becomes free firewood. I know this means cooking outdoors because for safety reasons, you should never cook over an open fire in an enclosed place. Some propane stoves are safe to use indoors, but double check the label to make sure. And, you can build your own rocket stove for almost free following these instructions. I think this scenario is why it is important to have canned goods and freeze-dried or dehydrated foods in storage. 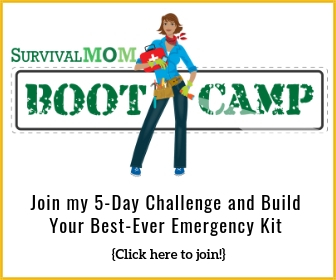 I have probably a 6-month supply of long-term food storage, most of it freeze dried. You can eat it right out of the can, if necessary. I’ve been able to make a yummy chicken salad with freeze-dried chicken, celery, and onions. No cooking involved. Fruits taste like candy right out of the can, they are so sweet, but nothing is added to them. It is 100% fruit that has been freeze dried. I also think a Sun Oven is a good investment if you have no electricity and can access the yard. Also, if you can cook outside, just having a grill could be a lifesaver. But the most likely scenario with these extreme natural disasters is no electricity for days or weeks. So, having the ready to eat food on hand is the top priority. 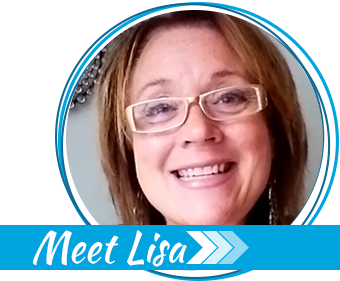 TIP- Look into the numerous reasons why freeze dried foods should be part of your food storage, and check out Lisa’s favorite brand of storage food, Thrive Life. I live in Florida, but one summer I served as a missionary in Eastern Europe and loved how almost everyone there has an outside “summer kitchen”! Here at home, I would make a workstation around the grill with an outdoor table/countertop and maybe a bin for dirty dishes or for washing dishes. It’s close to rainwater collection, trash, and compost, which is a plus. Also, I could easily throw water on surfaces to wash them down. I could get my messy on! Cook like you are camping! We’ve been through a lot and any time something crazy happens and we are required to function without a full-service kitchen, we focus on the basics. 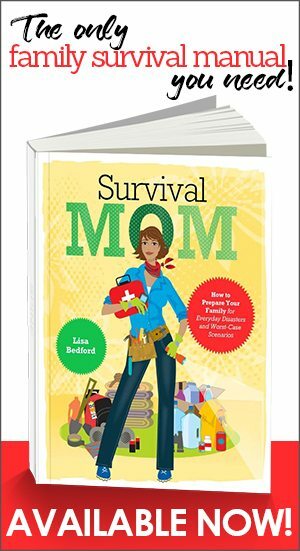 Propane camp stove, candle or oil lamps, Dutch oven (read this for getting started using a Dutch oven), homemade rocket, or solo stove made from tin cans. Get creative. Heat up items IN THE CAN — unless it has the plastic lining. One-dish meals make things easier, too. Ask the kids to help! Their young minds are so ingenious! TIP: For a fun and easy grilled cheese sandwich you cook over a campfire, read this. My house flooded last year, and after the first 2 months staying with family, we moved back in and lived in the gutted house while we rebuilt. My cooking station was a folding table with a microwave, electric burner, a pot and a skillet with a few cooking tools, and a few basic spices, plus a plastic box to store the dishes/spices in during the day. A basic utility sink with the faucet was $120, which we needed since the cabinets were all out. I had a 5-gallon bucket full of lentils, but they were not a good emergency food in this situation as they require too long of a cooking time to mess with on the little burner where you have to hold the pot steady. Canned goods, pronto pasta, and Spam made up a lot of our meals. We got folding chairs to sit in and used paper goods. We had pipes burst and flood half the house once. I had no kitchen for a few months while the work crew gutted and fixed everything. I used my gas grill, toaster oven, an electric wok, and the microwave. I have since obtained butane burners, a camp stove, and even a crock pot that runs on small propane tanks. We had no power for 3 weeks after Hurricane Wilma. We used our camping stove and the side burner of our grill. /We had stocked up on plenty of fuel for both. I also used my flat griddle and college-sized microwave for lots of things because I had a generator. I always have a grill with a side burner and extra propane tanks for just this reason. I also have extra cinder blocks for building a rocket stove, just in case we run out of propane. Lots of home canned goods to choose from. TIP- This is just a quick set of directions for a rocket stove you can put together in less than five minutes. It works and gives you one more option for off-grid cooking. I have a toaster oven/griddle/coffee maker combo, a George Forman grill, and a camping stove that I might use in that situation. I would probably only cook one real meal a day and do simple breakfasts and lunches. Even plain sandwiches taste better when popped in the toaster oven or Forman. On an open fire, except for rainy days on a Sterno. I’ve had to do this many times. it’s like a very long camping trip. I rather enjoyed it. But I’m weird like that. A solar oven is a must have for us, I made mine from very cheap materials. Works great. This website has instructions for making a very good solar oven for less than $20. I have 7 solar cookers, butane burners, thermal cookers, wonder bag, backpacking stoves, wood rocket stoves, a wood stove in the garage, grills, a fire ring with grate. You may not have a whole lot of storage room, so plan on making at least 2 shopping trips per week. 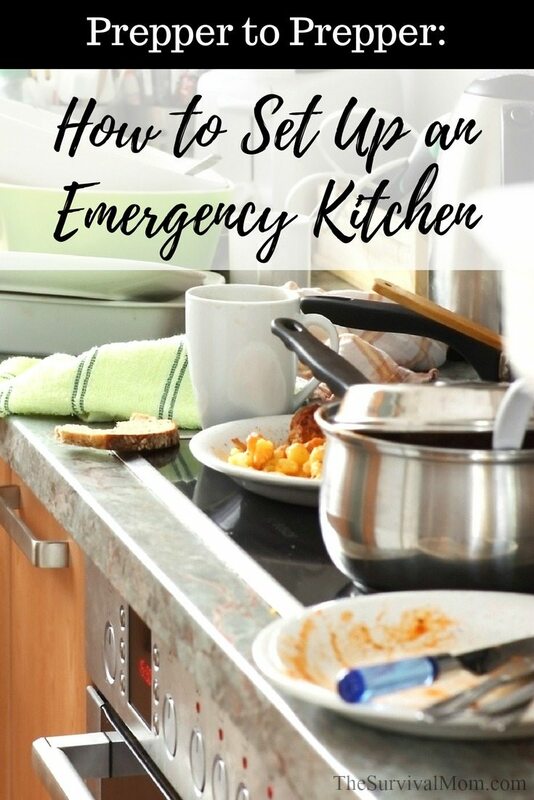 If you’re living in a small space, you’ll be needing every nook and cranny so it’s probably best to not have too much food at any one time. A power outage might also mean you don’t have a working refrigerator. In that case, only buy small containers of foods that need to be kept cold (such as mayonnaise) and use a heavy duty ice chest. Many foods that we normally keep in the fridge do not actually require refrigeration, such as eggs and butter. Be willing to ask for help from friends, neighbors, co-workers, your church, etc. People around you are wondering how they can help and often don’t know exactly what to do. Use disposable utensils, drinking cups, plates, paper towels, etc. to cut down on dish washing. Penny, can you post here a picture of the propane crockpot with name and model number, and WHERE did you find it? If not, let me know and I’ll send you my email, thanks!! Definitely invest in some cast iron cookware! You can use them over an induction cooktop, a gas or electric stove, over an open fire, or inside a solar cooker! I love, love, love my cast iron-mine are the Lodge brand. I have found a few pieces at the thrift store, but Walmart, HomeGoods, Target, and others all carry the brand new stuff. You will never regret this purchase. Just remember: it canNOT go in the dishwasher, do not leave water sitting in it, and if you have to suds something out-reseason it!! Other than those rules, this is the stuff that your great great grandaughter inherits.